To satisfy her wandering feet, eighteen-year-old Gillian McAllister is sent from Ireland to Canada in the summer of 1932. She arrives with her Irish ways intact, determined not to let the wiles of crop duster Christian Hunter woo her into submission. Yet as the summer unfolds and the sweet taste of love grows, Gillian’s appeal lures more than she anticipates, shattering the life they’ve built. Fourteen years, a Great Depression, and a World War later, Christian sets out to discover why Gillian was ripped from his life. What he discovers on the Isle of Man will change them both forever. Not even a thatched cottage by the sea, a spritely Gillian, or memories sprinkled on a page can mask the secret that has been buried for too long. But it isn’t until a set of poems is given to Gillian’s granddaughter that the real mystery—Gillian’s true secret—is freed. The book with the long title, don't let that scare you off like it almost did me. The cover is what grabbed my attention and the blurb just glitched it. A weird quirk of mine is location. When I saw Bruce Peninsula, the Great Lakes and Tobermory I was sold, these are my stomping grounds. Gillian spent the next several days trying to imagine why on earth Daddy would want her to go to Canada of all places. She needed to let the idea soak in. Honestly, she was furious with the man. India sounded so exotic -- all those spices! Canada sounded, well... wild. With such a great setting my expectations rose somewhat. I really hate putting pressure like that on any author, beautiful setting must equal beautiful story, right?. Did Susan Ornbratt rise to the occasion? 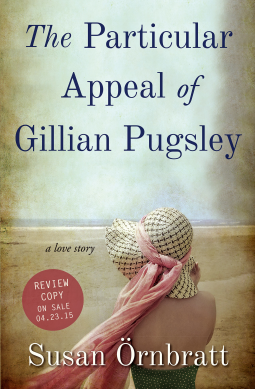 Of course she did, The Particular Appeal of Gillian Pugsley was an absolute pleasure to read! The authors writing style made it extremely easy to get lost in this story. Told in various time periods this reader had no problem connecting with Gillian. First introduced when she is 89 years old (2003), then she takes us back to 1931 and then 1946. Gillian is such a likeable character, she is adventurous, open minded and genuine. First she is a nanny for a family from India, then off to the wilds of Canada. Her relationship with her sister and father was played out nicely, the bantering between them added much to this story. I loved the strong bond between Gillian and her granddaughter, Gilly (who is tasked with writing her story) was the finishing touch this story needed. The plot was intriguing, kept me on my toes. There is much going on here, a beautiful love story, mystery, trauma of WW II and more. With vivid descriptive prose it wasn't hard to picture scenery and the added poems was a unique idea and enhanced this story nicely. While the story weaves back and forth in time, as well as alternating POV's it wasn't hard to get totally invested in this book. It's such a strange phenomenon with writers, the way a story starts to breathe life, the way the characters become real, the way a writer becomes a servant to the story as much as its creator. This is Susan Ornbratt's debut, reminiscent of Kate Morton and Susanna Kearsley, I highly recommend.